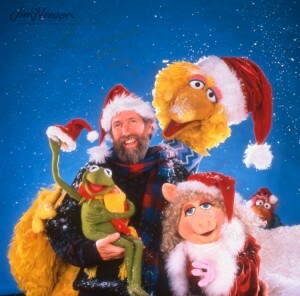 In the 1987 television special, A Muppet Family Christmas, Kermit explained that he valued the holiday as it represents, “…the whole family starting to come together…life would just pass in a blur if it wasn’t for times like this.” Jim agreed, remarking that, “It’s what I think of Christmas as being, a time for family to gather together.” Given that he had been branching out into an array of styles and media during the 1980s, it made sense that be might bring the group – both puppet and human – together for a reunion under the guise of a Christmas special. 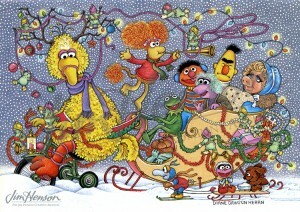 For the show, Jim charged his long-time creative partner, Jerry Juhl, with writing the script and they called in what was described in the press materials as, “a group of performers with a couple of hundred collective years of puppetry experience.” These were the people behind (or under) the characters from Sesame Street, The Muppet Show, and Fraggle Rock representing the three dominant species of Muppet. 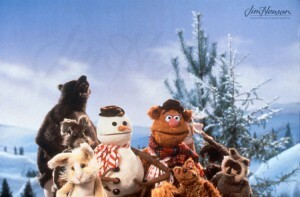 Co-producing were Martin Baker and Diana Birkenfield, two seasoned professionals that, between them, had worked on practically every Henson production. Another stalwart of the Henson team, Peter Harris, directed, and veteran Larry Grossman oversaw the music. 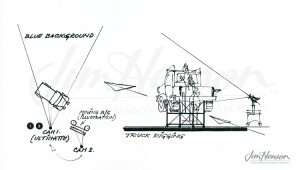 The set was designed by Stephen Finnie, a regular part of the Henson team on practically every Toronto production going back to the early 1970s. An array of Muppets representing The Muppet Show, Fraggle Rock, Sesame Street, and Muppet Babies on the 1984 Henson holiday card designed by Diane Dawson Hearn. 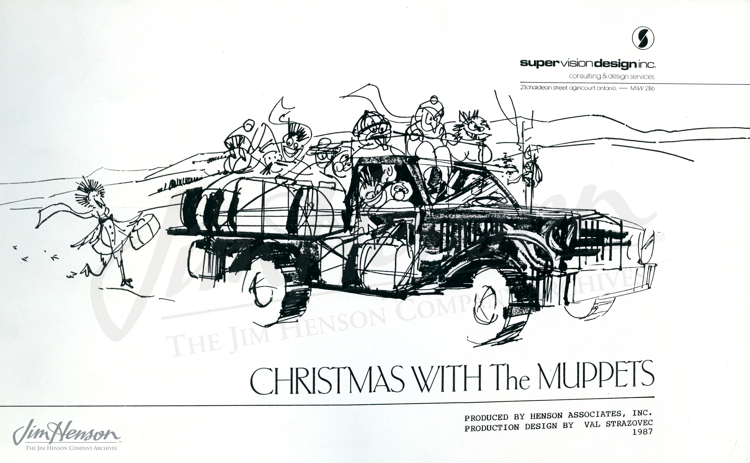 Val Strazovec’s scenic designs for A Muppet Family Christmas, 1987. Fozzie and his comedic partner, the snowman, in A Muppet Family Christmas, 1987. Jim celebrating the holiday season with his Muppet friends, 1987. 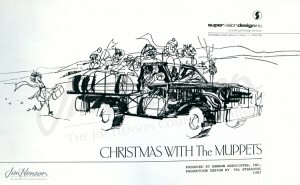 This entry was posted in 12-December '87, 1987, Muppet Specials, Social and tagged Christmas, Muppets, UK. Bookmark the permalink.